Drinking tea is about the entire sensory experience. Part of this is being consumed by the aromatic quality that your tea releases. With this thoughtfully designed cup, you’ll experience the intensive aroma from your tea like never before. Size: L: 9.3 cm - H: 16.1 cm - Vol: 0.45 L / 15.00 fl. oz. Daily rituals are important to stick to. They are the perfect way to jumpstart your day. They help you to feel grounded. They bring a sense of serenity and purpose. Make one of your daily rituals drinking a delightfully aromatic cup of tea. 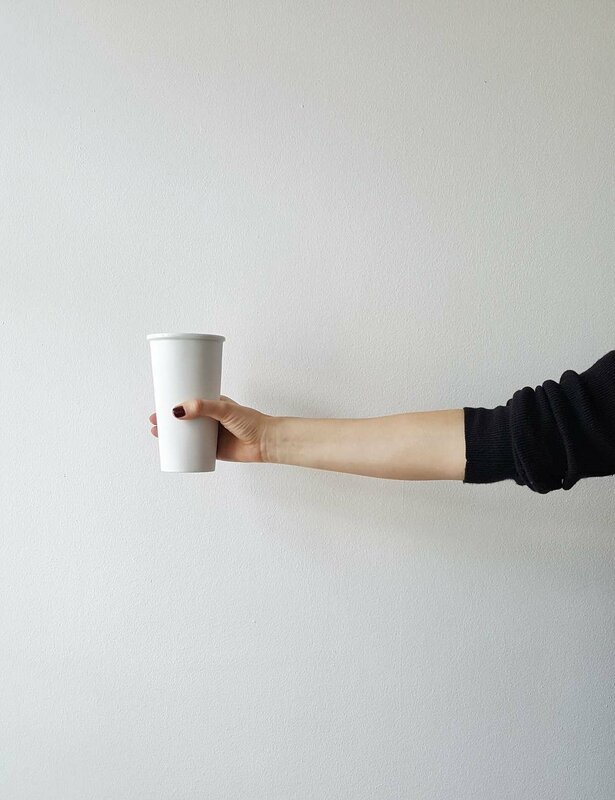 The Anytime Emma cup is a minimalist’s dream. This fresh design comes in purist white reflecting both the natural porcelain material and your own peace of mind. The distinctive tall and narrow dimensions have been purposely designed to give you an idyllic drinking experience. The height and narrow width are perfect for maximising the aroma that your tea releases. This playful and personalisable design is ideal for taking time out for yourself. The 450mL that this pure vessel holds is made for those who need to be reminded to slow things down. Take a breath. Be consumed. Let the sensory experience take over. Does the porcelain have a glossy or matte texture? The Anytime Emma cup has been finished with a textured white matte glaze. This gives it a modern urban look, feels wonderful in your hands, and makes a real statement. The lip of the cup and inside are finished in a smooth glossy texture which provides a textural contrast while keeping the inside easy to clean. How much tea fits in this cup? The Anytime Emma fits 0.47L of liquid. This is an extra large cup. You can rest assured you won’t need to keep going back to the kettle to refill this cup, although you may need extra teabags! This cup is also double-walled, so even though it’s big it will stay warm until you reach the bottom. Can you write on the side of the cup? Our porcelain products are all made from a premium porcelain that is 100% lead and cadmium free, and hand-finished by skilled artisans. When you select the best tea, you want to be sure that nothing is compromised, and especially not leaching harmful chemicals into your tea. Our porcelain has been selected with your health in mind so you can focus on enjoying your favourite beverage. Why does it look like a paper cup? Porcelain is a wonderful, natural material that is durable, has a low impact on the environment, and will last years and years. Yet if you saw this cup on a desk in an office you’d be forgiven for mistaking it for a disposable paper cup. That is, until you pick it up and feel the lovely solid weight, the cool ceramic, and the textural matte glaze finish in your hand. 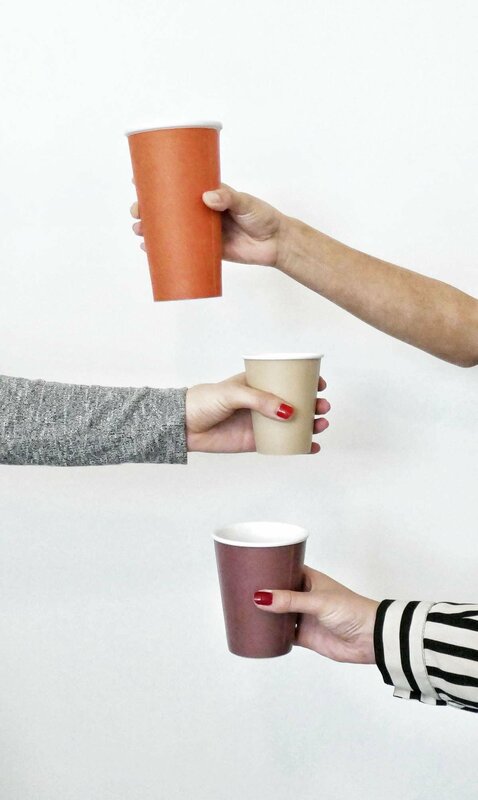 Shaping this cup like a disposable cup is a visual pun that invites people to meditate on the environmental impact of their choices. Aside from that, it’s also just super chic.